The SciPlus 2500 is the only talking scientific graphing calculator designed specifically for users with low vision. SciPlus 2500 is an easy to use, fully portable, talking, large display scientific graphing calculator featuring an enlarged keypad with high contrast and 0.7-inch tactile keys. Talking function enables speech output in either English or Spanish (can be turned off when not needed). Other features include a generous 6-inch, four-line display with adjustable contrast, adjustable backlight, inverse video, lightweight portable design and long life battery. USB charger and convenient protective carry case also included. 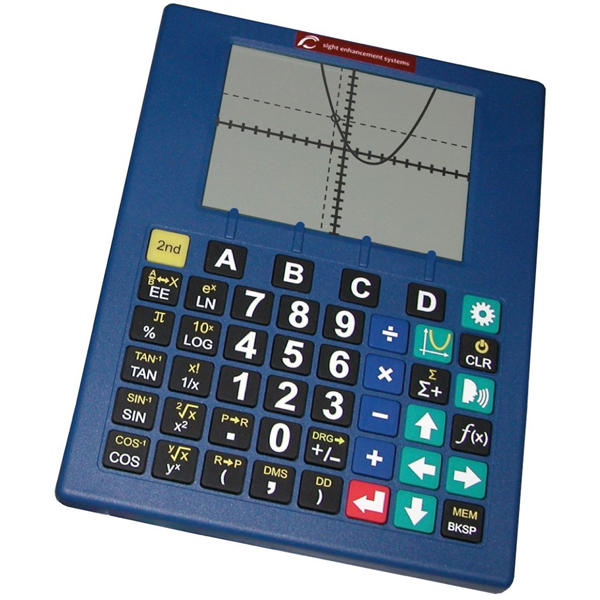 In addition to performing all other scientific, statistical and trigonometric calculations, the SciPlus 2500 calculator adds the ability to graph and plot equations, analyze values along a curve, and determine y-intercepts, poles, etc. As a result, the SciPlus 2500 is the most complete and innovative talking scientific graphing calculator available to visually impaired users. * Lightweight and portable, weighs just 20 oz.